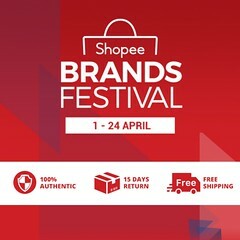 Nowdays, any F&B to make it to the mark for first 3 months is to come out with a concept, cool different name whereby it can be Japanese,Korean, French that can capture user’s attention then you are ready to go or move into a specialize shop like Pie. 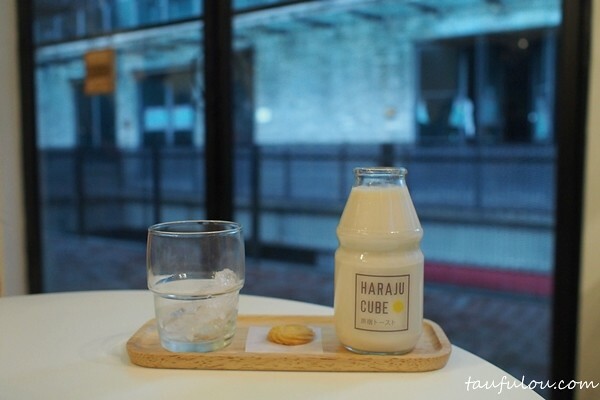 I was introduce to this new cafe that had just open its door to public whereby they are less than a month old. 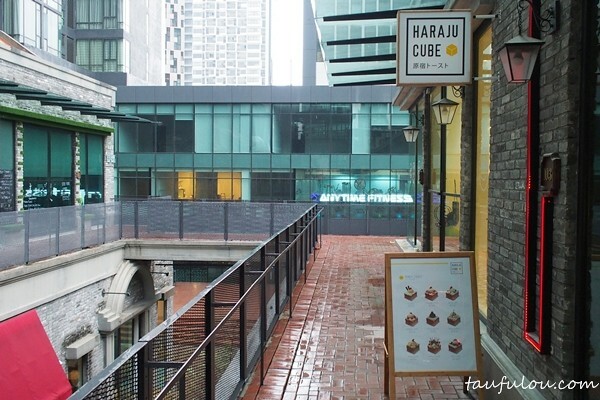 To find this location is not that hard as Haraju Cube is located directly above Texas Kitchen or Opposite Anytime Fitness. 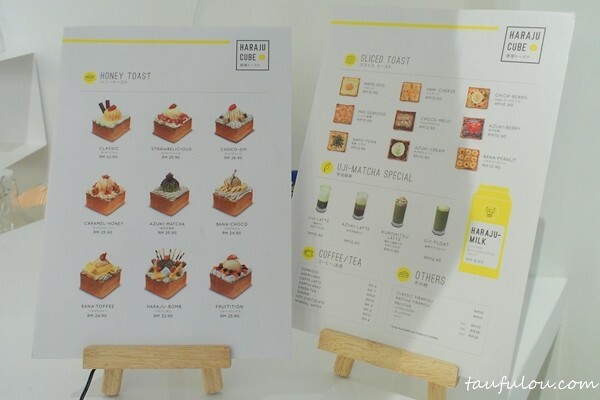 Their concept is Japanese honey toast! Yap, “not like those you found in Papa Rich or any other outlets”. 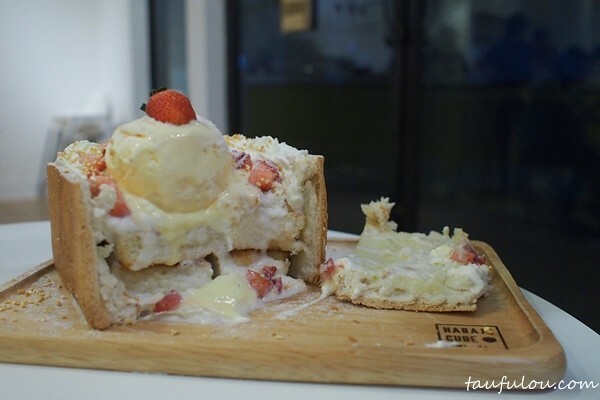 The unique concept is a whole loaf of bread encasing towering bricks of cube-shaped bread, decked with extravagant toppings such as ice creams, fruits, nuts and whipped cream. 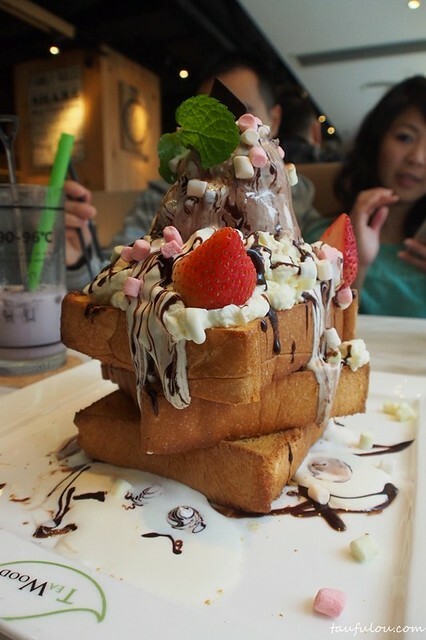 According to some other blogs, they are serving higher quality, tastier toast and bigger portions. Oh well, to me its still the same thing. 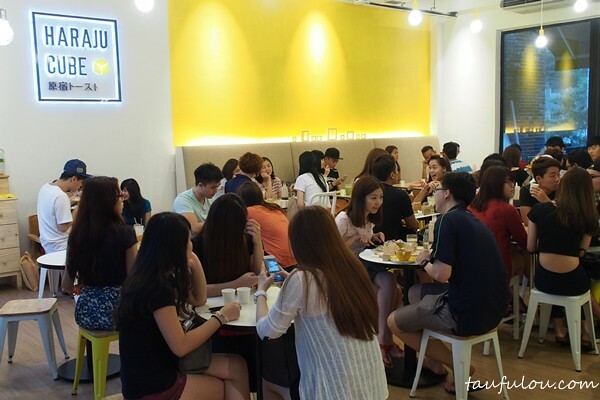 Its raining heavily today and I thought no one would be here and to my surprise its full house. The only thing I am proud to be here that is, it makes me feel young again, with all these teenagers and young adult. 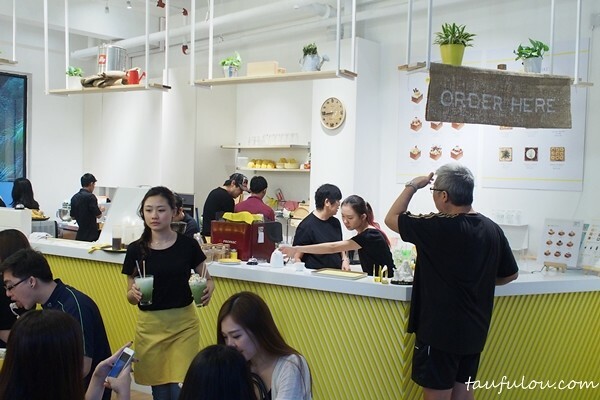 Simple comfy ambiance as the wall is painted bright yellow taxi colour and with some hanging garden kind of concept at their kitchen area. I was speechless when I saw the pricetag on each of this toast. 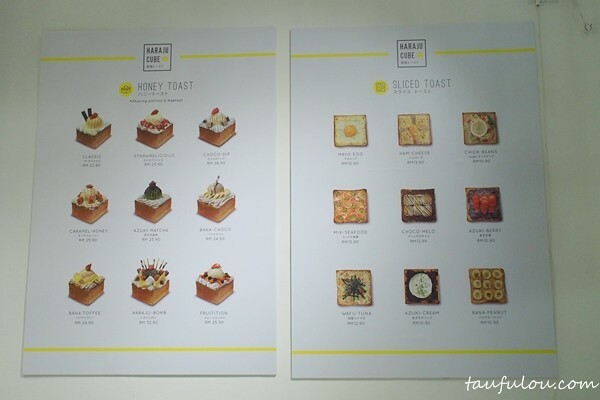 From slice toast its from RM10.90 – RM 15.90 and those Honey Toast is from RM 22.90 – RM 32.90. Some recommended this Butterscotch Milk @ RM 8.90 whereby a blogger mention RM 6.90 3 weeks ago and find it its a pretty huge jump for AFTER GST implementation. 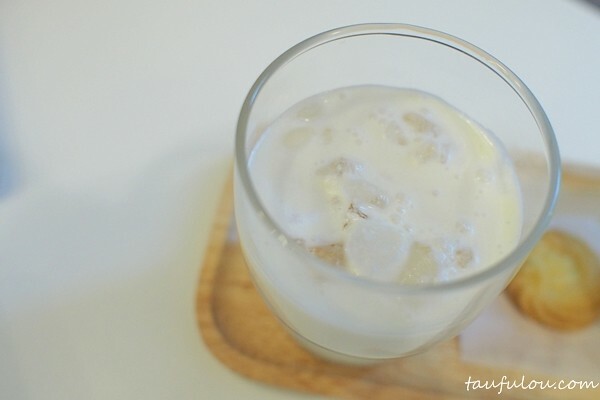 Find that the taste is milk, slightly creamy and I do not taste any butterscotch taste. Nothing fantastic actually. 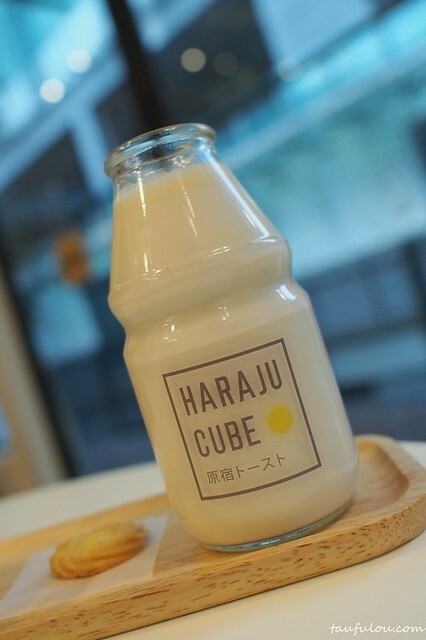 The most hype product in the outlet or known as their signature, so we ended up ordering Strawbelicious @ RM 25.90 and waited 45 minutes for this. 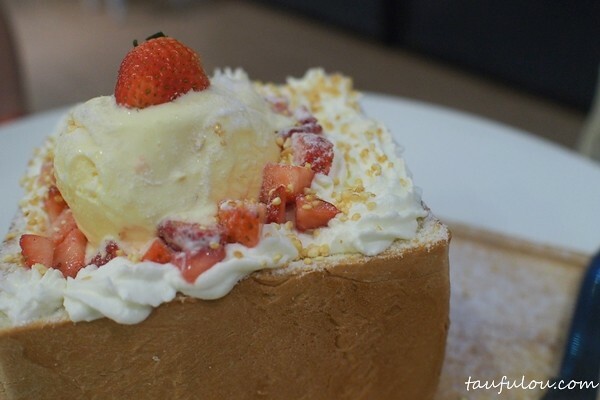 Serve with whipped cream, strawberries and ice cream. Open sesame and what do you have in there. 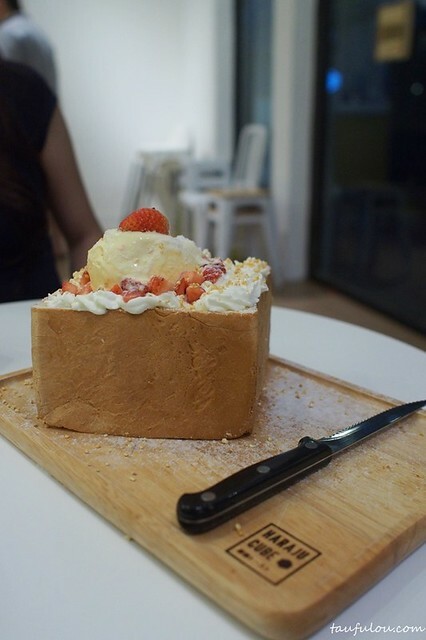 Some cubes size of oven bake/toast in it. Skin is pretty hardend and hard to chew whereby I see alot people skip eating that. Cubes are decent as there are nothing to shout about. Add in some some of their maple syrup to give you add on taste. 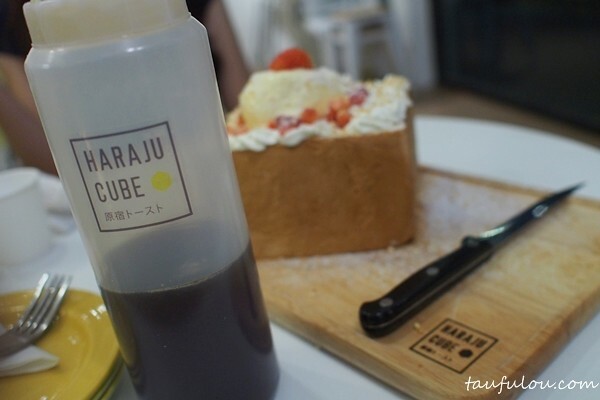 Another big hype when I was in Hong Kong that my friend mention to give it a try last Dec is also about their new item in cafe business by this Tea Wood. 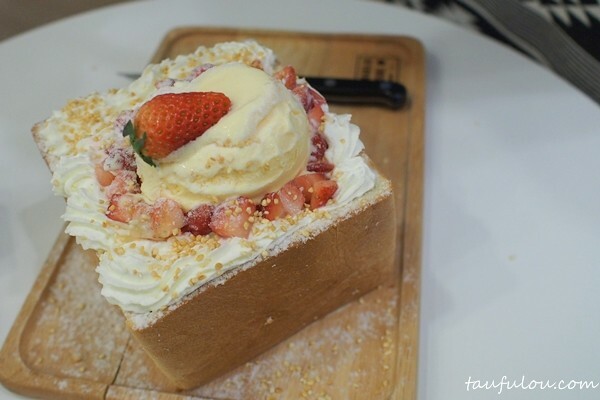 Also Toast and its gigantic. Verdic of this. Nothing to shout about too. Oh well, seriously I think I am not the right fit for this market as I find it very pricey, just a normal toast and the value you are paying I would say, good for just one photoopp. Wont be coming back another round. **Price in them the menu did not include GST yet.